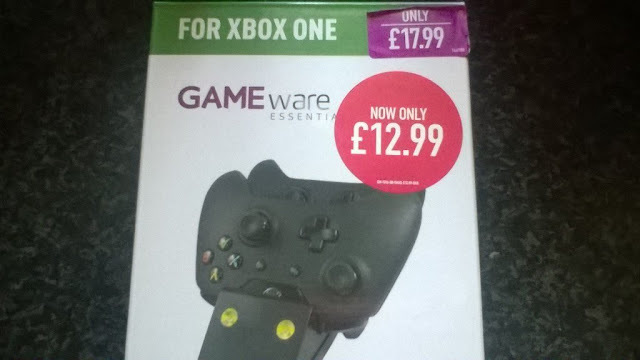 Being honest, I've never been a fan of GAME branded products in the past, with the two kids breaking things like Xbox 360 headsets way too easily only a week or so after buying them. I had hoped quality had been taken up a notch since I last gave them some of my money. Well turns out this wasn't going to be the case, and there was a reason this item was on sale. It all started going wrong right from the off really, with the dock itself feeling really cheap, and the batteries themselves having numerous issues that I will go into right now. Placing the batteries into the controller for the first time was easy enough, but the first issue came when trying to remove them one day for a reason I forget. The batteries have three plastic grips to click them into the pad and keep them there, only when you do connect them it decides that this battery never wants to leave your controller ever again, having a grip on it like a small child hanging onto its favorite toy. You end up doing that thing where you know damage is imminent when trying to remove something, but you try your best to make it as minimal as possible by going at it like a Rubik cube. I was successful the first few times but dreaded having to take them out at any time. With two kids though that day came soon enough, as one day the daughter tried to take it out and snapped one of the plastic sections off it, with me doing exactly the same to another one (even when trying to remove like a bomb expert cutting wires) a few days later. This did fix how tight it was gripping into the controller though, and it did make them much easier to remove (so take note GAME). The biggest issue, however, was just the quality of charge that the battery would hold, with the batteries lasting anywhere between two to three hours on a full charge, which I'm sure you will agree is nothing to a gamer who plans a long night gaming. It got to a point where myself and the daughter would have to have standard batteries on hand at all times, as no one wants their pad dying midway through a game of Roblox or part way through a FIFA 18 online match. I could leave it on charge all night and still get the battery low warning when the three-hour mark approached, with bog standard batteries at least lasting a few days or longer than three hours even if they were a budget brand. The final annoyance and nail in their coffin came with the charging dock, with the quality of it being as light as a feather and socket to charge that looked like it would come off if you just looked at it wrong. One day it got knocked off the lowest shelf known to mankind, so low I reckon an egg could take the hit and survive. Not this dock though, oh no. Upon touching the floor and it being picked up the part where you plug in the cable to bring power to it decided to just fall into the device and make the dock nothing more than a piece of plastic. And that's where my short time with the device ended. Overall: If you see one of these charging docks on sale out in the wild (think new versions of this device are now available) AVOID IT AT ALL COSTS. GAME already fleece gamers dry when it comes to trading in prices and things, so why I expected quality and something to last me a while from their brand of devices I will never know. Wow, even on sale it wasn't worth it! I got an official one for around a score and, thank God, it still works 4-5 years later. Hopefully Xbox does what Switch has done and have built in batteries for their design of their next controller. My Switch Pro Controller holds a 36 hour charge, unfortunately they cost £60 a piece though!